Jack Dunn prepares to hit. The junior shortstop and the Wildcats had an up and down weekend in Kansas. Despite an electric Saturday at the plate, Northwestern could not match host Kansas’ output in the bookend games of its series in Lawrence. The Wildcats (2-4) lost their second straight series to start the 2018 campaign as they claimed only one of their three games against the Jayhawks (5-2). Junior first baseman Willie Bourbon continued his hot start to the season with a great weekend at the plate. Bourbon went 6-for-14 over the three games with two opposite-field home runs, a triple, a double and seven RBIs. For the first game of the season against Nebraska (Omaha), Bourbon was in the nine-hole. For all three games this weekend, the junior was in the clean-up spot, a position he said he had not been in since high school. Senior third baseman Connor Lind said Bourbon is confident at the plate. Bourbon said he is trying to use the middle of the field and not do too much. The approach is working so far for the junior. After collecting only five extra base hits last season, Bourbon has seven so far this year in only six games, and he has already broken his single-season high in home runs. NU’s offense wasn’t clicking quite as well in the opening game of the series, when Kansas picked up a close 4-2 victory over the Cats. Starting the opener for Kansas was ace Jackson Goddard, who is ranked 48th in Baseball America’s top 50 junior prospects. The Cats managed to get eight baserunners against Goddard, but could only muster two runs against the righty. “He gave us a couple opportunities, and when you get those opportunities you have to come up with hits or balls in play, and we probably didn’t do not that enough on Friday night,” coach Spencer Allen said. Game two of the series was a slugfest 18-12 victory for NU. The two teams combined for 30 runs, 36 hits and 18 extra-base hits. The Cats got out to the early lead with 7 runs in the first three innings and managed to keep their lead at more than 5 for the rest of the game. 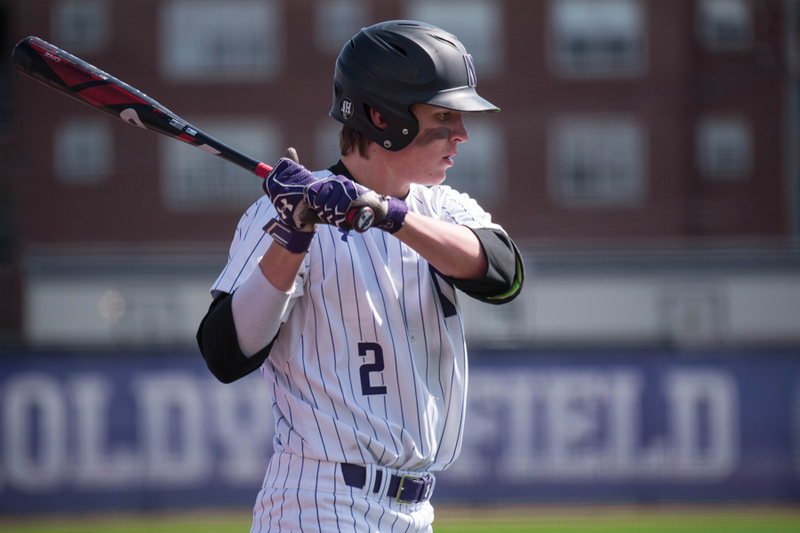 Each NU starter had a hit and scored a run, with Bourbon and freshman center fielder David Dunn both picking up two and three knocks respectively and sophomore second baseman Alex Erro crossing home four times. The Cats also had seven doubles and six stolen bases on the day. “The offense really ramped it up in the second game and showed flashes of what we can be,” Bourbon said. In the rubber match of the series, NU again got on the scoreboard first with a Bourbon round-tripper in the second inning but this time the Jayhawks immediately returned fire. They scored three runs in the bottom half of the inning, broke the game open with three more in the fifth and eventually secured a 10-3 victory and 2-1 series triumph over the Wildcats. Allen said the Cats have missed some opportunities defensively and on the mound in each loss so far and wants to see his team tighten up going forward.